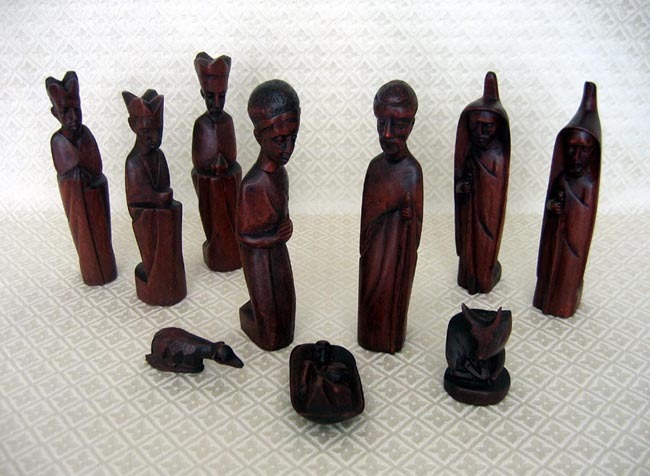 This 10-piece Nativity set was fair-trade imported from Rwanda. The pieces include Joseph, Mary, and baby Jesus, two shepherds, a zebu cattle, a sheep, and three wise men. The light-colored wood pieces are stained brown. The wood is probably jacaranda. The tallest pieces measure 8 inches. This Nativity set was probably carved by a man, but it is distributed by an female-led organization that works with 54 cooperatives throughout Rwanda, employing thousands of weavers, most of whom are women. Each cooperative is structured so that Hutu and Tutsi weavers work side by side, promoting reconciliation as the country struggles to rebuild from its terrible war in 1994.